Bryan, Jeff and Kyle nerd out on the Rose City Comic Con crowd in this month’s Throwback episode! It’s time for some traveling! Step into our TARDIS and zip back to the year 2013 where we covered the Kaiju of Pacific Rim in a panel at Portland’s own Rose City Comic Con. 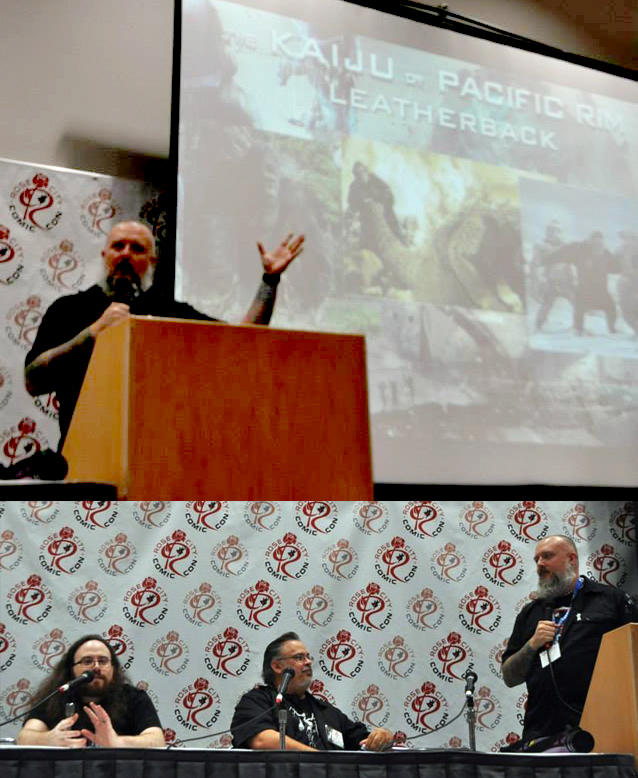 We had a nearly full house for this panel – and to be honest, we couldn’t believe the amount of convention attendees that wanted to hear more about the monsters from Pacific Rim and what could have/did inspire the designers who made them. I am hoping to find the video that Martin shot and merge it with the audio from this podcast and upload it to our YouTube channel soon. Big thanks to Rose City Comic Con’s Mikey Neilson for scheduling us for this panel – it was a blast! Don’t forget to send in your homework for our next daikaiju discussion, Godzilla vs. King Ghidorah (1991). You’ll need to get that sent in before this Friday (the 20th) to have it included in the next episode!